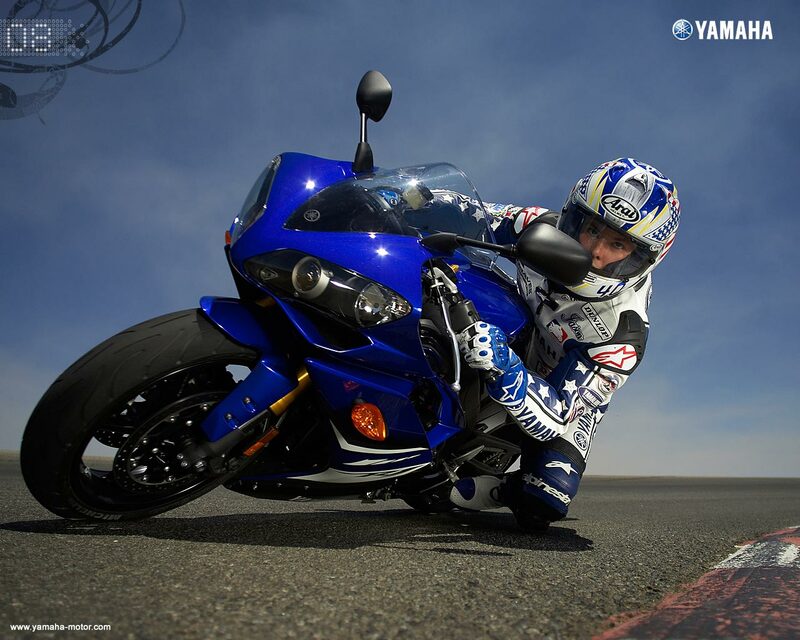 The 2-Wheeled embodiedment of Yamaha’s most advanced technology. The cutting edge for sport bikes doesn’t get any sharper. The 2008 R1, a showcase for Yamahas most advanced sport bike technology. With MotoGP inspired features like chip controlled throttle and electronically variable intake funnels, the R1 provides a level of riding excitement, confidence and control never before experienced. The R1 features more ground breaking technology than ever seen before. From chip controlled throttle and electronic variable intake funnels, to the advanced Deltabox V frame design, Yamaha strives to offer experienced riders a whole new level of exhilaration and riding excitement. Despite serious power, the R1 is more obedient and more civilized than ever before. Ultra-lightweight, compact, 998cc, DOHC, 16-valve, liquid-cooled, 40 degree inclined, in-line four-cylinder engine produces incredible horsepower. The 4-valve cylinder head design features a compact combustion chamber that utilizes lightweight, trick titanium valves on the intake side. The 4-valve design maximizes breathing efficiency and overall engine performance. This design also achieves cleaner emissions too. The titanium intake valves are 33mm in diameter while the steel exhaust valves are 27mm in diameter. Lightweight yet super strong VX alloy valve springs controlled valve movement. The lightweight titanium intake valves reduce the reciprocating weight of the intake valves allowing for higher rpms without the concern of valve float. The use of lightweight “Ti” valves has allowed the engineers at Yamaha to use a 4-valve format. In the past, the use of 5 smaller valves allowed a higher rpm limit since each of the “smaller” valves was relatively light. The use of light weight high tech titanium now means the engineers no longer have to use the 5-valve design to achieve the same high rpms. Yamaha will not abandon the 5-valve format on YZ models … it has its own advantages such as a less tall cylinder head design (lower center of gravity) since the actual valve “lift” can be reduced with 5-valves. Short design valve guides provide a less restrictive flow of fuel / air flow into the combustion chamber for improved power output. Computer optimized smooth intake ports increased intake air volume for increased power output. Squish area has been optimized for maximum engine performance. The compression ratio is 12.7:1. Lightweight, high lift, high performance intake and exhaust cams help to provide incredible horsepower and fast engine response. Automatic cam chain tensioner reduces both maintenance and engine mechanical noise. Short skirt, lightweight forged pistons feature 4 valve “pockets” to special ribs in the piston pin area add rigidity for great reliability. Connecting rods are carburized and use a nutless design. The lower end “cap” of the rod is made from the same piece of material as the upper portion; this design is known as “fracture splitting”. This design aids establishing true big end roundness and greater precision in con rod dimensions. Closed deck cylinder design allows the cylinders to be spaced more closely together, allowing a narrower engine, since there are no coolant passages in the cylinder body. The cylinder block is a stand-alone piece; the benefit is improved sealing, and easier serviceability. Ceramic composite cylinder “bores” are a “liner less” design with the ceramic coating sprayed directly on the aluminum block to ensure uniform heat dissipation for consistent power delivery, reduced oil consumption, reduced friction and reduced weight. Lightweight revised crankshaft provides super quick engine response. The surface treatment of the crank is high frequency quench type. The ACM or alternator is located on the backside of the cylinder block to reduce crankcase width. The compact ACM uses rare earth magnets and spins at 1.24 times the engine rpm to produce lots of electrical output. Narrow, compact crankcases allow for maximum lean angles. Mikuni fuel injection system uses 45mm throttle bodies fitted with T.P.S. (Throttle Position Sensor). The secondary motor-driven sub valves have been eliminated from the throttle bodies due to the addition of the YCC-T. An oxygen sensor has been fitted into the exhaust making this a “closed loop” type FI system. The benefits include excellent throttle response, great fuel economy, reduced emissions, stable idling and no choke to fuss with during start up. The actual injectors are Denso “long nose” type injectors with a high dynamic range and 12-spray holes for improved power and response across the entire rev range. The fuel injection’s lightweight Electronic Control Unit (ECU) utilizes a powerful 32-bit processor for fast control of the injection process. The compact design also reduces weight. YCC-I or Yamaha’s Chip Controlled Intake means the intake funnels / stacks vary in length depending on engine rpms and throttle opening. At low to mid rpms the funnels are longer and as the rpms increase, the funnels reduce in length via an electric-control servo motor to provide maximum horsepower, torque and throttle response at all rpms. The range of movement is from 65mm to 140mm. The YCC-I provides the best of both worlds …solid low rpm performance with amazing high rpm power. YCC-I ensures that the intake tracts are always “tuned” to the ideal length for the prevailing engine rpm. It takes 0.3 of a second for the funnels to move from the highest to the lowest position. The YCC-I electric-control servo motor-driven variable intake funnel system is a world’s 1st on a production motorcycle. Yamaha Chip Control Throttle (YCC-T) electronically controls the throttle valves for outstanding response and improved controllability at all rpms. The YCC-T is used to provide even more control of the intake air volume for smoother torque character. Similar to the R6 design, the YCC-T features 3 – ECU’s inside the main ECU to control ignition, fuel injection and the YCC-T. This special ECU is capable of responding to changes at a speed of 1000th of a second. The rider can “mechanically close” the throttles by simply closing the throttle twist grip. Twin electrode NGK CR9EK spark plugs. Compact close-ratio 6-speed transmission features optimized gear ratios for maximum performance. The “stacked” 3-axis gearbox / clutch design stacks input/output shafts to create a low center of gravity and keeps overall engine size shorter front to back. As a result, the stacked design gives the engineers the freedom to place the engine in the “sweet spot” of the frame for optimum weight balance for awesome handling. The all new slipper or back limiter clutch assembly reduces rear wheel hop when making hard down shifts or under hard braking. Key benefit is reduced lap times and smoother control when riding aggressively during a race or track day. A multi plate clutch is used, utilizing coil springs and paper based fiber plates. High capacity water pump features a plastic impeller. “Ram Air” system “force feeds” cool air via dual ducts located below the headlights into the intake system. As speed increases the air velocity in the system increases and pressurizes the air box. This “force fed” air helps the engine develop maximum high rpm power. 7.3 liter air box maximizes performance. A viscous type air filter is utilized. 4 into 2 into 1 into 2 titanium exhaust system maximizes power output, reduces weight and improves aerodynamics. The dual under seat mufflers provide an aggressive sound as well as a great styling highlight. This system contains two 3-way catalyziers and an oxygen sensor (note: the catalyst tube is made of stainless steel). The catalytic converters reduces harmful CO and HC exhaust emissions while the oxygen sensor provides feedback to the ECU to maintain optimum fuel/air mixture at all times. EXUP System (Exhaust Ultimate Power Valve) utilizes dual titanium butterfly valves that prevent the “blow back” phenomenon caused by “valve overlap”. This design reduces weight and maximizes cornering clearance. The EXUP system eliminates “flat spots” in the power band and reduces emissions too. Compact, high-efficiency curved radiator features dual ring-type fans for maximum cooling efficiency. This curved rad and twin fan design produces more airflow than conventional flat designs to maintain optimum engine temperatures for consistent power output. Large liquid-cooled oil cooler maintains stable lubricant temperatures for extended engine life. Convenient cartridge style spin-off oil filter. Convenient clutch cover sightglass ensures easy oil level inspection. High performance direct ignition coils (ignition coil is built into the spark plug cap) reduce weight while iridium spark plugs and high-output magneto deliver increased spark energy. Aluminum Deltabox V frame has been designed to offer an optimized rigidity balance to maximize handling performance. This frame is very rigid or stiff at the head pipe, engine mounts and swingarm pivot point. In other areas, material has been carefully removed to allow “tuned flex”. Finished in black, this frame boasts a compact 1415mm (55.7″) wheelbase. The swingarm pivot has been optimized to minimize the chain tension effect under hard acceleration, providing more stable handling. The engine is a fully stressed chassis member to maximize handling. Stability, a key to great handling, is unsurpassed while the ability to hold a line under hard acceleration is excellent. Detachable aluminum sub frame means easier rear shock access and a less costly repair if the unit is “looped out”. Extra-long, lightweight aluminum C.F. (controlled filling) die cast “truss-type” swingarm provides great torsional rigidity for class leading handling and maneuverability. The distance between the swingarm pivot and the rear axle has been optimized (597.2mm) for excellent “turn-in” abilities and rear wheel traction. The Deltabox V chassis offers an incredible 56 degree lean angle. Fork off set of 25mm both rigidity and handling. Revised forged aluminum lower triple clamp features an increase in thickness from 35 to 40mm for increased rigidity. Fully adjustable 43mm Kayaba inverted fork features 120mm (4.7″) of wheel travel. The thickness of the inner tube and the shape of the outer tube has been optimized. The size of the internal aluminum piston is 24mm damping performance, and the piston rod is lightweight aluminum. The adjustable design allows the rider to tailor suspension settings to match rider weight and road /track conditions to maximize handling and suspension performance. There is 9-way spring preload adjustability plus 25-way compression damping and 26-way rebound damping adjustability. Link Monocross rear suspension utilizes a fully adjustable piggyback-style rear shock. The shock spring rate has been increased, the internal piston has been modified to reduce friction and a 2-way (hi speed / low speed) compression adjuster is utilized. The rising or progressive rate is 14%. Adjustments include 9 steps of spring preload adjustability, 20-way high speed compression damping, 4 -way low speed compression damping and 20-way rebound damping adjustability. The reserve sub tank is mounted horizontally to accommodate the under seat exhaust. The adjustable design allows the rider to tailor suspension settings to match rider weight and road /track conditions to maximize handling and suspension performance. Steering damper is located under the upper triple clamp. Its special design is sensitive to the speed of the damper shaft, the faster the movement the more damping and the slower the movement the less damping. Radial mount 6-piston calipers squeeze revised, fully floating 310mm dual front rotors. The result is incredible braking performance with excellent control and lever feedback. Brembo radial pump master cylinder with 16mm piston is a direct GP race innovation. The lever is adjustable for various hand sizes. Single piston (aluminum) slide-type Nissin rear caliper squeezes a lightweight 220mm rotor. Rugged yet lightweight 5-spoke mag wheels front and rear. The wheels utilize hollow “spokes” to reduce unsprung weight for superior handling. Front rim size is a MT3.50 x 17 while the rear is MT6.00 x17. Fuel tank design provides excellent knee grip for hard braking and great rider maneuverability. The capacity is 18 liters with a 3.4 liter reserve. Immobilizer ignition system is designed to reduce the possibility of “ride away” theft. This system must recognize the “coded ignition key” in order for the unit to start. If the immobolizer ignition does not recognize the key (or a theft’s screwdriver or other type of “jimmy tool”) the bike will not start even if the ignition is turned or forced into the on position. If the system does not recognize the coded chip in the ignition key, it will not allow the ignition system or starter motor to function. Race inspired fairing improves both aerodynamics and style. The fairing features a slant nose front profile for aerodynamic streamlining, with engine revealing side cut outs. Windshield features a “screw less” design for a cleaner, more trick appearance. Dual 55-watt projector (low beam) and dual multi-reflector (high beam) headlights feature a sleek, cat-eye profile for superb aerodynamics, unique styling and excellent visibility. Both headlights light on low beam and all four headlights light on high beam. Revised LED taillight reduces weight and power consumption while providing a brilliant eye catching light. The lens is white while the LEDs are red. The seating position offers a very sporty yet comfortable riding position. Heavy-duty #530 O-ring drive chain. Low maintenance, lightweight, sealed battery. Convenient fold out under seat bungee cord straps.